Dark and interesting, the W800 Special Edition mixes matt and gloss black surfaces with gold anodised style rims, detail features and subtle highlights into an intoxicating cocktail. Back to the future, the new W800 Special Edition delivers a classic blend of retro style with up the minute technology. Drawing fans of all ages, the quality and W heritage of the air-cooled parallel twin shine through. The W800 Special Edition is the result of a thorough pursuit of the beauty and ride feel posessed by vintage notorcycles. It offers a rare beauty care of components meticulously crafted down to the smallest detail, as well as a feeling of authentic quality that can only come from using metal parts. The throb of the air-cooled Vertical Twin engine and the distinct handling character that comes with large-diameter wheels recalls the ride feel of machines from an older generation, gone but not forgotten. The W800 Special Edition, in both looks and feel, pays homage to Kawasaki's legendary W1, the model that started a brand that spans 45 years. Add Radiance and Authentic Quality- Metal parts used in favour of plastic throughout- Deep chrome and buffed engine covers add to high-quality finish- Even small parts are formed of blacked-out aluminium- Corrosion-resistant parts ensure lasting beauty. Vertical Twin Engine Rich in Character- Loads of feel-good pulse from an engine displacing 773 cm3 - Unique pulse care of a 360° crankshaft- Maximum torque at 2,500 rpm- Strong low-mid range torque enhances unhurried pleasure of a Vintage Ride- Heavy flywheel contributes to the strong torque feeling in the low-mid range- Now with fuel injection. Matt black exhaust - Talk softly, but speak strong. Cool matt black exhausts sound good and add subtle streetwise character. The W800 Special Edition produces loads of feel-good pulse from the Vertical Twin engine displacing 773cm3. The strong low-mid range torgue enhances the unhurried pleasure of the vintage ride. The W800 Special Edition features a fuel injection system that does not take away from the vintage look of the motorcycle. 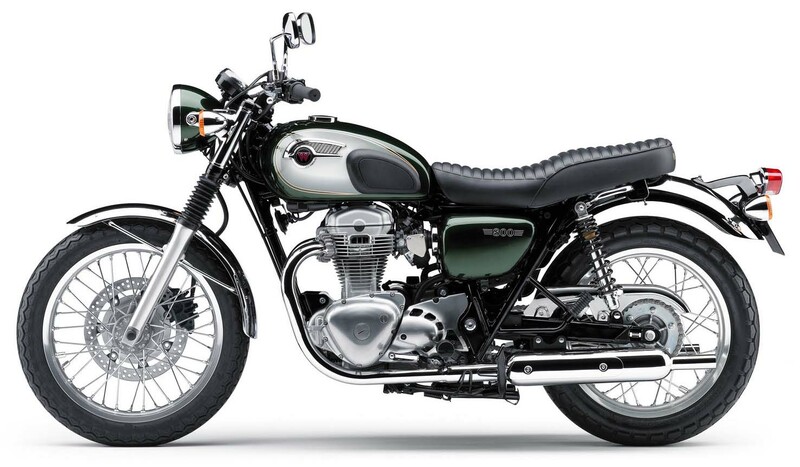 The W800 Special Edition is the latest model in a brand that spans 45 years with Kawasaki's original W1 debuting in 1966. It was the largest displacement Japanese model of its time. Metal parts are used in favour of plastic throughout the W800 Special Edition. Corrosion-resistant parts have also been used to ensure lasting beauty. The 19" front and 18" rear wheels add to the classic appearance of the W800 Special Edition. The 19" front provides that classic handling feel with a fine balance of relaxed, light turning and straight line stability. Long, comfortable seat with thick, ribbed padding has plenty of room for rider and passenger. Urethane at the front of the seat is shaped to facilitate the reach to the ground. Piping around the edge of the seat follows the line between the rider and passenger's legs to ensure it does not cut into the rider's thighs when at a halt. As much as possible, plastic was eschewed in favour of metal. The result is a feeling of authentic quality that can only be obtained from the solid feel of metal parts. Voluptuous fuel tank finished in high-quality paint contributes to the W800 Special Edition's aura of functional elegance. Newly designed tank emblems, finished in chrome, contribute to the high quality appearance. 5-way adjustable clutch lever and 4-way adjustable brake lever enable riders to fine-tune lever span. Single 300 mm front disc brake offers sure stopping power. 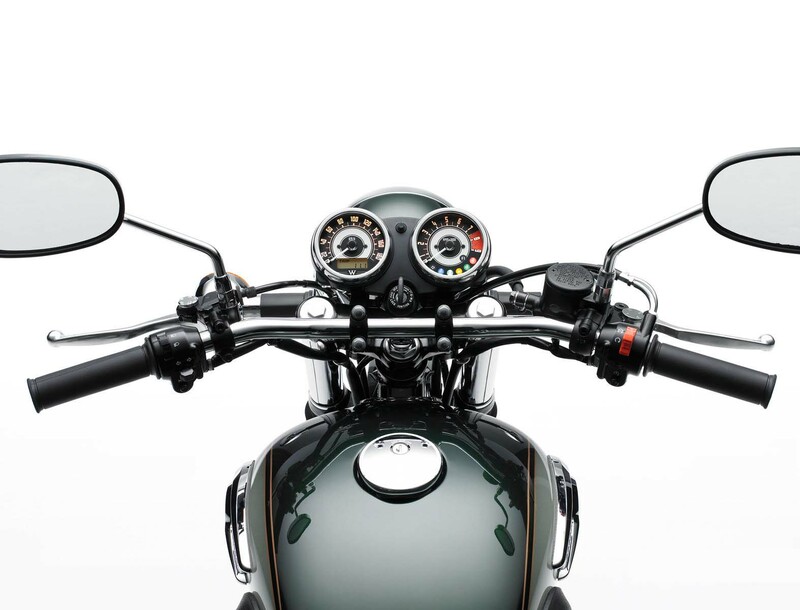 Large headlamp is offset wonderfully by the speedometer and tachometer and simple console. Simple, elegant muffler design comprises smooth curves and long, straight lines. Peashooter-style silencers with slim chambers and long tailpipes add a vintage touch. Traditional instrumentation includes individual speedometer and tachometer with classic display. A multi-function LCD screen incorporates an odometer, tripmeter, and clock. A full range of indicator lamps includes an FI warning lamp, dual turn signal indicators, low fuel level indicator, high beam indicator, neutral indicator, and oil pressure warning lamp. "Building a beautiful engine" was a key concept when designing the air-cooled Vertical Twin. The classic-styled engine is lightweight, simple and a joy to behold. Iconic bevel-gear-driven cam adds beauty to the cylinder head while contributing to the engine's classical appearance. Dual rear shock absorbers, adjustable for spring preload, offer a smooth ride and clean look. Traditionally styled front fork uses rubber gaitors to protect the fork tubes and ensure long fork seal life. Outer tubes have a buffed finish, which contributes to the light looking front end. 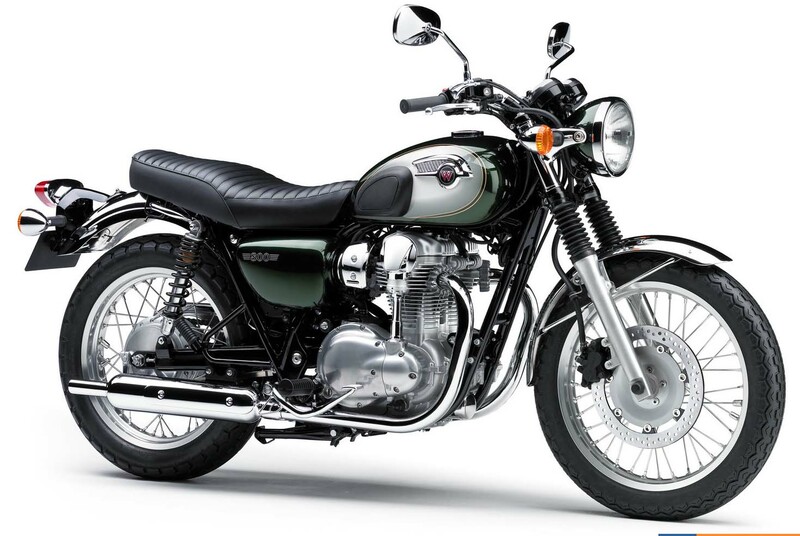 Kawasaki were the first of the Japanese brands to go seriously retro with their W650 more than a decade ago. Despite this, Triumph’s modern day Bonneville (also largely manufactured in Asia) had more cred’ with the buying public, thanks to that British brand name on the tank. The Triumph was also the more appealing ride, having improved and changed over the years, while the W650 remained the same. 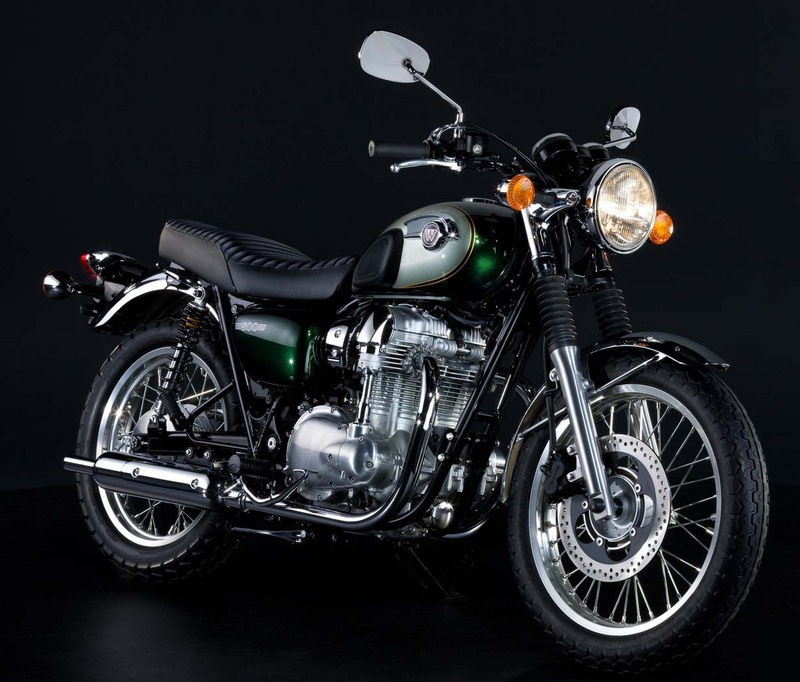 In 2011, thanks to a 5mm larger bore, Kawasaki have reinvented their machine and the W650 has grown to become the W800 and this time around Triumph should definitely sit up and take notice. Retro-chic is all about the look and the W800 is a truly stunning machine. The attention to detail on this bike is really a class above the competition. The chrome rims with their beefy spokes, the authentic lighting, saddle and streamlined tank, all ooze class. The W650 did a reasonable job in this regard but the W800 has stepped it up another few notches. It is only upon close inspection of details like the switchgear and small LCD gauge inside the instruments, that you actually realise that this is not the real deal from the 1960s. And you certainly don’t have to be of that vintage to appreciate this classic styling – I certainly am not! You get the style without the kick-starting or oil leaks. The vertical side-by-side twin certainly looks the part with the bevel-drive cam a particular masterstroke of the stylists. Despite a 360-degree crankshaft and heavy flywheel the rider is largely isolated from what’s going on beneath them, which is a little disappointing. Nothing a set of rorty pipes wouldn’t fix though. Developing maximum torque from as low as 2000rpm, there is no real benefit in revving the fuel-injected mill too hard. It revs cleanly to 7000rpm but the best grunt is available between 3000 and 5000rpm. Acceleration off the line is a little sluggish but once up and running the W800 responds okay. There is no real feeling of significant thrust as the engine is just so incredibly smooth. Expect to be surprised, however, when you look at the speedo. Top gear roll on from 60km/h or 100km/h is actually quite respectable and a downshift is rarely needed to accomplish a swift overtaking manoeuvre. Its pull is deceptive. The fuel tank holds a modest 14 litres, but the W800 easily betters 20km per litre which gives the Kawasaki a 280km range. The spring rates in the twin shock rear end are quite soft but the damping does a reasonable job of keeping it from bouncing too much over bumps. One up it is passable, but if carrying a pillion I really think some stiffer springs will be in order. Again, that’s quite an easy fix and if you really enjoy pushing through corners then throw in a set of stiffer springs in the 39mm forks while you are at it. Sporting prowess in the hills is not really the design brief for the W800. Although it is much better in the hills than virtually any cruiser style motorcycle you care to name. The skinny rubber helps make the W800 feel very athletic when sweeping smoothly from bend to bend and as long as you attune to its limitations it still offers a fun ride in the hills. There’s no pressure riding a bike like this, you just pick your pace and rock your socks off along your favourite riding route. It’s not quite as competent in the hills as the Triumph iterations on this theme, but it’s still good fun and you don’t really care. The single disc front end has no ABS, nor any need for ABS, as there isn’t enough stopping power to lock the front. The forks couldn’t cope with serious stopping power anyway and again it’s a horses-for-courses scenario. I think some female riders would appreciate less effort being required at the lever though and a little more braking power would be welcome. This style of bike is perfect for a Sunday cruise out for lunch and would additionally make a fantastic commuter. The W800s easy going nature, smooth engine and low seat height makes for a ripper bike around town. It is certainly worth serious consideration amongst buyers that are after something with plenty of style but endowed with handling dynamics far superior to the vast majority of cruiser style motorcycles. And for a fraction of the price. At $11,999 plus on roads is a little dearer than the base model Bonneville from Triumph but it is $1500 cheaper than the Bonneville SE. 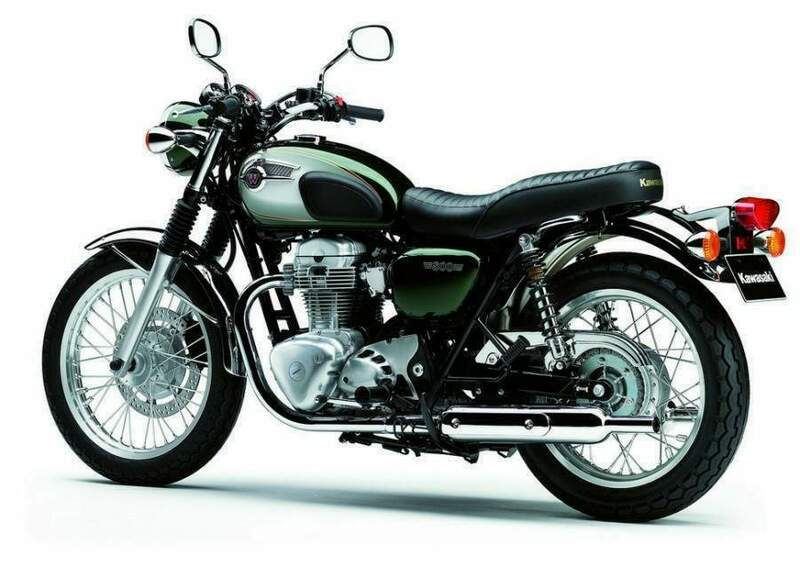 The clincher is that the Kawasaki is a more authentic retro experience than the Triumph, but for some it won’t matter how good it is if it doesn’t have that Triumph badge on the tank. Unfortunately for Kawasaki, that’s just how it is.